. 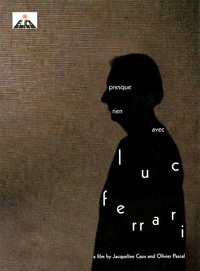 :: Elica Editions ::: Luc Ferrari ::. Luc Ferrari is one of the most important and intriguing figures of the last forty years, a pioneer of musique concrète at the beginning of the Groupe de Recherche Musicales in Paris (GRM) and perhaps "the only real artist among many excellent researchers" as someone suggested, with a very peculiar sensibility creating his own musical world in which wit, sensualité, extreme sound realism, playful analytical abilities, social concerns, fascination for ambiguity and love for life are important and inspiring elements. No matter how radical his musical intuitions and concepts may be or have been, his music has always had a provoking but charming quality. Elica is honoured to present for the first time a hidden treasure in the Luc Ferrari catalogue and certainly one of the most outstanding pieces in the composer's production. 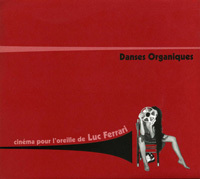 Danses organiques is a 50-minute piece of 'cinema for the ears' which could be described as a 'strange meeting between two girls and a tape recorder' and is one of his most unorthodox, lively and sensually charged pieces, recorded between 1971 and 1973 in a period when he was leaving the official studios to build his own independently, and it was "completely recorded on my small machines: I recorded the single tracks separately and then superimposed them to create an organic whole". The composer lends his tape recorder to two girls who are to meet and to start a relation and then builds his imaginary folklore music around their confidential dialogue, sighs and moans, with the addition of his deep observations on organ-ic music. The music has a somehow groovy poly-rhythmic quality in its surreal synthetic development, concluding in a spectacular tour de force of psychedelic dimensions, and it is outstandingly modern with its similarities to some unacademical homemade music produced today with electroacoustic means. Maybe it is unfair to say this, but Elica thinks this is one of the most beautiful and advanced musical pieces ever recorded. Digi-pack type cover with 16-page insert containing a long text by Samon Takahashi (in French and English), short biographical notes and, quite amazingly, photographs of the two main characters in the work, taken at the time of the recording (please see LP version below). LP record in a gatefold sleeve with bigger reproduction of the pictures included in the CD release and the addition in the notes of the English translation of Luc Ferrari's spoken introduction to the piece, which caused much controversy and confusion among non French speaking listeners. The first DVD release on Elica is a beautiful 50 minute portrait of composer Luc Ferrari made by his friend Jacqueline Caux with Olivier Pascal, which is at the same time fully informative and acutely representative of Ferrari's spirit. Featuring Elise Caron, as Luc Ferrari and herself, and Luc Ferrari, as himself only, going through archive documentation, intriguing dialogues, invented autobiographies, music performances, evocative installations, sidewalk accidents, encounters with sound-makers builder Christof Schläger and electro musician eRikm, etc.... Documenting the work of one of the most groundbreaking and seductive composers of the Twentieth Century, this film also shows Luc Ferrari's "extremely libertarian personality: his spontaneity, his inclination towards hedonism and sensuality, his curious and open character, his rejection of all kind of power and of all stable position within institutions, his pronounced taste for jeux, his sense of self-derision and his ferocious refusal of all dogmatism". Jacqueline Caux is a writer, film-maker and organiser of live events who is the author of the essential interview book with Luc Ferrari, same title as the film, as well as of books on Anne Halprin and Louise Bourgois, and is the author of several experimental films and remarkable documentaries, which include the highly acclaimed Detroit : The Cycle of The Mental Machine on Detroit Techno and a brand new film on the performance of Ferrari's Symphonie dechirée. Olivier Pascal, has collaborated, among others, with film-director Claude Duty. All region DVD with digi-pack type cover with notes in French and English by Jacqueline Caux. After the publication of Danses organiques, Elica is pleased to present two previously unreleased compositions by Luc Ferrari from the early 80's: the stereo magnetic tape piece Dialogue ordinaire avec la machine coupled with Sexolidad, a composition for fifteen instruments. Both pieces share with the Danses a deep sense of sexual curiosity, a penetrating matter for the composer's musical explorations. Dialogue ordinaire avec la machine describes the not so chance meeting between the artists (Ferrari helped by Yannick Gornet) and the mysteriously working machine (a sampler), between the curiosity, amusement, surprise, ineptitude and excitement of the musicians and the machine with its appeal, complexity, stubbornness and synthetic eruptions. 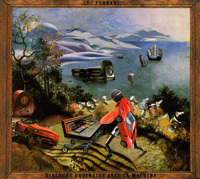 A rollercoaster through exploration, seduction, observations, misunderstandings, purrs, moans, gurgles, whooshes, loops and mechanic rhythms from which Ferrari builds his own synthesized folklore, ending with one of the most unusual episodes in the composer's production, the rather graphically explicit and apocalyptic Love Song with the Machine (which to make an unlikely comparison with younger artists, one could imagine the music of the New York duo Suicide mixed by Nurse With Wound's Steven Stapleton). Sexolidad is one of Ferrari's most seductive instrumental pieces, representing a journey over the body, in which tonalities and their mix create "a particular harmonic climate [...]. What is important is the expression this pseudo-tonal atmosphere should bring out, as a sort of sensual, and even carnal, satisfaction". The curious concept and its musical composition result in an extremely enjoyable piece which is continuously intriguing, evocative, dauntless, persuasive and highly satisfying, exquisitely performed here by the Ives Ensemble. Digi-pack type cover with specifically retouched artworks by Jacques Brissot, whom Elica considers one of the greatest living visual artists, who has also directed films for which Ferrari composed the soundtrack and who also made the cover for the composer's Cellule 75 LP. It also includes a 24-page booklet with bilingual (French-English) versions of the integrated text from Sexolidad and the hot lyrics to the Love Song with the Machine.